The next phase of the £300 million regeneration of the University of Birmingham has been launched as the institute starts its hunt to find a developer. The university is planning to build almost 180 bedrooms in a new block of student halls and a neighbouring sports facility next to the Grange Road Gate area in the south west of the Edgbaston campus. 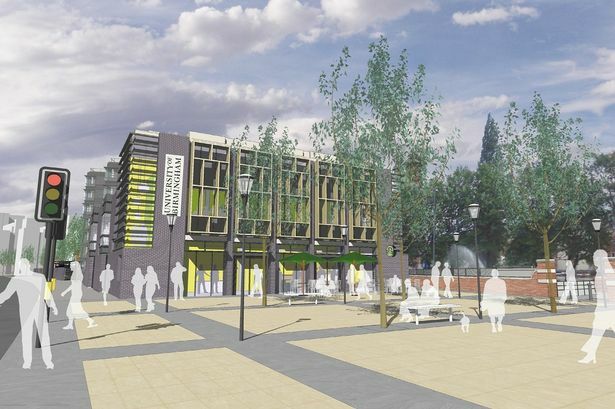 It forms part of the wider transformation of the university grounds which includes a new student services hub, Chamberlain Halls and green park while work is under way on construction of a library and the £55 million sports centre with the city&apos;s only 50-metre pool. University of Birmingham has placed a tender for this latest phase which will see a new 54,900 sq ft residential complex containing 178 bedrooms across 34 shared apartments. The proposed design is for three, interlinked blocks of student accommodation ranging from five to seven storeys. There will also be a separate, two-storey sports pavilion covering 11,840 sq ft which contains eight changing rooms, a café, bar and function room with support facilities next to the Bournbrook pitches. A new route into campus from the Selly Oak New Road is also proposed to allow vehicles to access the servicing area more easily. Kevin Dickinson, director of projects at the university, said: "The Grange Road entrance is a key entrance to our campus and the main exit into Selly Oak for students, staff and visitors. "The new halls of residence and sports pavilion will create a lively atmosphere at this key junction and provide high quality accommodation for our students in a great location and another exciting sports facility which will work in conjunction with the state-of-the-art sports centre already being built nearby." Outline planning permission for the whole scheme was granted as part of the university&apos;s hybrid application last year.